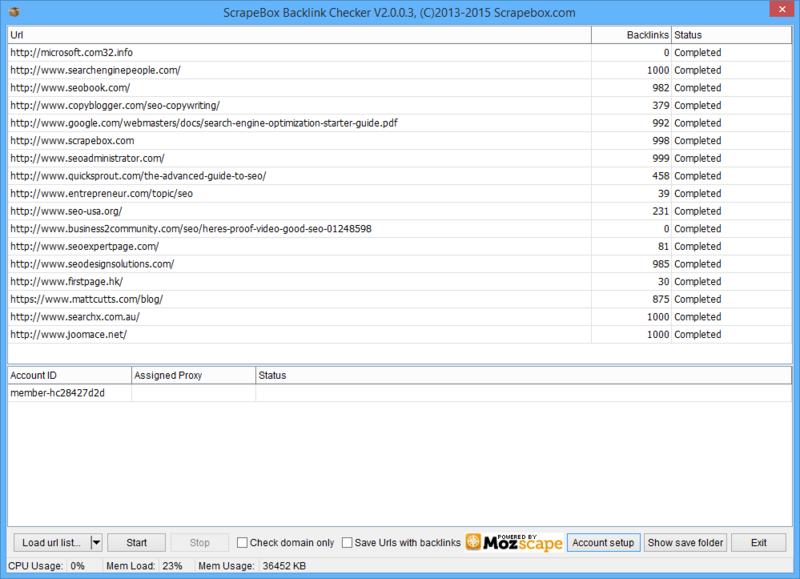 The ScrapeBox Backlink Checker Addon allows you to bulk check the number of backlinks a URL or Domains has and also allows you to download the top 1,000 backlinks for each URL which is provided by the Moz.com Mozscape API. This is great for doing backlink audits for your website, or doing competitor analysis to view the URL’s where your competitors have obtained their backlinks from. To use this addon you will need to register for a free or paid Mozscape API key to add to the account setup in the addon. URL’s to check can be loaded in to the addon from a text file, or transferred automatically from ScrapeBox. You can choose to check the backlinks to the URL or to the Domain, and backlinks for all domains can be saved to a single text file or you can save the backlinks and corresponding domain to individual .xlsx files for use in Excel. So if you need to find out where your competitors are getting their links from, this is a great addon to fetch those backlink URL’s so you can see how the links were obtained and if you can get links in the same locations as well.You could even load the URL’s directly in to the Comment Poster and try to obtain links on compatible platforms automatically. There’s no limit to the amount of domains you can check, if you have a free Moz.com API account then the tool throttles the requests to one check every 10 seconds per free API key added to the tool. If you have more than one API key then checking time is reduced. View our video tutorial showing the Backlinks Checker in action. This is a free addon included with ScrapeBox, and is also compatible with our Automator Plugin. We have hundreds of video tutorials for ScrapeBox.